Condo landlords are finding increased competition for rental accommodation coming from, of all places, the shared office space business. These services provide office space for anyone from individuals to large corporations. Increasingly, they are moving into the residential living space. Small condo suites combined with a lack of space to work in common areas are a problem for those who operate a business out of their home or work for a business and require personal working space. Meeting and other rooms that are part of common areas have proven unpopular with those who need to get work done. These spaces are generally inhospitable to productivity and go unused for much of the day. Condo dwellers requiring space to work prefer to pay for a more hospitable work environment rather than work alone at home or in a building not conducive to productivity. WeWork is the largest player in this market. Founded in 2010, the company now operates in more than 50 cities around the world including Toronto. There are currently two Toronto locations with a third on the way using the top two floors of the Queen Street Hudson’s Bay store. Traditional shared working spaces providing self-contained cubicles, a shared board room and reception services are no longer necessary. Today’s businesses no longer require someone to answer phones, take messages and provide typing. 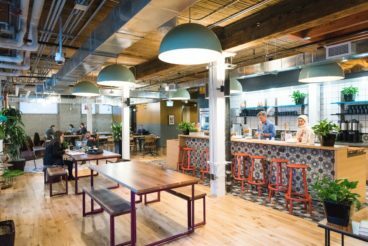 Modern working spaces designed for “We” collaboration are attracting everyone from small businesses to large corporations. Office space is designed around a watering hole – cafe style with comfortable seating and non-alcoholic drinks. The company offers seminars, workshops and social events throughout the week. Glass walled offices provide individual space to accommodate everyone from the single-person business to an entire team from a large corporation. 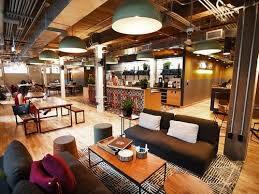 WeWork offices are intended to be conducive to working, networking and meeting clients. All spaces include Internet access, package acceptance, furniture and cleaning. WeLive are fully furnished apartments above WeWork shared office space. It includes common areas that allow hundreds of residents to prepare dinner in a high-quality kitchen, play pool or socialize on an outdoor terrace. WeLive are spaces to meet people while living there for a few months or many years. Accommodation, available long-term and by the night, is designed so people can move in with just their suitcase. Buildings are organized into communities by floor. Each community has its own design and theme. Rent includes housekeeping services, social bar and happy hour. The first WeLive buildings opened in 2016. The company anticipates nearly 40 locations throughout Canada and the USA in the next year. Where WeLive residents are also WeWork clients, morning and evening commutes are simplified.